The popularity of historical fiction is on the rise. For a long while it was associated mainly with ‘bodice rippers’, and told tales of brooding earls and swooning heroines with heaving bosoms. But luckily it’s left that image behind and really come into its own as a genre. It is getting the respect and attention it deserves. The best way to define it is as fiction set more than fifty years in the past and one in which the author is writing from research rather than personal recollection. The goal of historical fiction is not to simply show readers what life was like in another time period – history text books are better at that – but to show us how that particular setting is reflected in the character and plot of the novel. How the people we meet in its pages can only have acted in that particular way because of the circumstances of their time. This helps us see the differences and similarities between our own perspectives and theirs. Seeding by Beaux Lee does all this, and more. Set in Louisiana at a time when slavery was an accepted facet of life, we meet some truly amazing characters. The first of these is the enslaved Louis Brown who so impresses his admittedly enlightened owner that he grants him freedom. Louis leaves with his strong wife and a few other people and founds Brown Ville that becomes a magnet to free people of colour and runaway slaves. The small settlement grows quickly, offering opportunities to the coloured people but grating on the whites. There are numerous horrific and totally unjustified attacks on them, but their courage and spirit shine on. Then the story focuses on little Louisiana Brown, who suffers more than her share of trauma but she epitomises the soul of Brown Ville in her strength and determination to succeed. She has her own natural curiosity and intelligence to support her, as well as a loving family and a cousin, Moxie. The two become inseparable despite their very different upbringings. So when Moxie is forced to leave home, Louisiana – or Baby Girl as Moxie calls her – is bereft. But worse is to come. After her father and brother are senselessly killed before her eyes, and her mother and little brother vanish during a night of terror, she flees and eventually tracks Moxie down in New Orleans. Reunited, these two spirited, exceptional young women begin their conquest of this vibrant city in a somewhat unconventional way. This is a gripping book. There’s humour, horror, romance, violence, injustice, loyalty but above all hope and optimism, and a fascinating set of characters. And there’s more to come – this is the first book in a trilogy. I asked Beaux Lee some questions about Seeding and also about being an author. Tell us very briefly about Seeding. Seeding is the foundation of the trilogy, Flowers Die Young. I really wanted to take my time and thoroughly introduce my reader to not only my characters but also my setting, New Orleans. With an understanding of both, I thought it would make for a far more authentic feel to the story as a whole. What’s the story behind the story? Why did you write this book? I just wanted to shed some light on some of the things that went on in New Orleans in the past. I researched the city’s history and it almost seemed like a story that someone had made up already. A city that is older than the country itself and influenced by various countries, that was relaxed about slavery and allowed open racial mixing during a forbidden time in history, that legalized prostitution, was the home of mafia plots for presidential assassinations… the list goes on. I found this very fascinating and just let my imagination run wild with some of the facts that I discovered. I hope I encourage others to look into this historically unique city as well. Madame Leblanc. While researching and learning about the madams who ran the brothels of Storyville in New Orleans, I was most intrigued. This character quickly came to life before there ever was a story to write. I spent so much time developing her that I had to edit much of it out to shorten my book! Larry Brazier. I think we are very similar. Hardworking, strong, quiet, but when we speak we strive to make it impactful. Patient and long-suffering, but ready and willing to make a stand as well. What makes Seeding stand out from the crowd? I think it is unique because it is covering a very unique time and place in history. Not many have written about life in New Orleans during the times stretching from slavery and running up into life in America’s only red light district. It seems as though those would be worlds apart yet this was reality. Therefore Seeding actually sets itself apart. 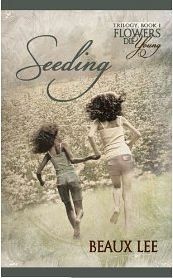 Seeding has a fantastic cover. Tell us about that. I found it difficult to find a single image that I felt would capture my book in its entirety. I had the joy of working with a great illustrator, Reese Dante. The moment he suggested this cover I was blown away. Everything revolves around these two characters and I think the cover depicts them in their purest form. What made you decide to go the self-publishing route? I feel that things have changed for the better. There are pros and cons to each way of publishing but at the end of the day, I believe that the things you can do for yourself, you should do. Do what you can, learn on the fly if you have to. The gratification you get from pushing that ‘save and continue’ or ‘publish’ button makes it all worth it. Don’t give up! Nothing is too difficult. If you love to write and wish to share it with the world, nothing can stop you in this day and age but yourself. The Bible. The 1611 King James version. Researching for my next project! Do you write every day? Is it hard to find the time? It depends. Sometimes I lock myself away for days to write morning, noon, and night. Other times I feel like I’m forcing it. I’m not afraid of taking a few days off from writing altogether either. It can be challenging at times but where there’s a will there’s a way. What ereading device do you have? And why did you choose that one? I read from my kindle, iPhone, iPad, or anywhere else that I can. No preference here. Do you dress up or dress down to write? Or maybe you don’t dress at all?! Where can we find your website? And on other social media? My website still isn’t up yet. I am on google+, Beaux Lee, as well as twitter @beauxl. Please connect with me there! And finally anything else we need to know about you? Nope, I’m a simple man!